Okay, even though I "dropped out" of Civic Park after the big fire, I'll get started with the identification project. I'll go by the teacher, the row (starting from the top), and the photo order (starting from the left). Interesting note about Mr. Grindstaff. He taught himself to be ambidextrous in case he lost a hand. He worked in the shop and in construction in the summers. Anyone remember that paragraph you had to copy if you got in trouble? Looks like Kim, except I remember her hair being more blonde. It certainly is the right year. I believe that is Kim Decker too. On the 3rd row of that picture is Diane Edwards. I don't know the name of the girl next to her, but didn't she live behind the Custacks? I also see one of the girls from the Tyler family on the end. Angie maybe? In the next frame, I see Kelly Conroy and Alicia something(forget her last name) next to her. 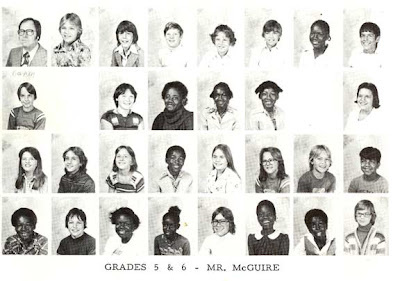 In Mr. McGuire's class I recognize Lynette Tegis (next to McGuire) and Kim Burch (3rd row), both from Humbolt Street. I just stumbled across your blog after looking for information about the library attached/next to Civic Park Elementary. 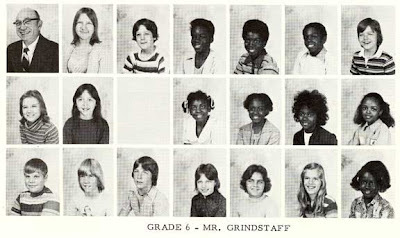 I attended in the early 70's and had both Mr. Grindstaff and Mrs. Schofield as teachers. Don't know anyone in the pictures though. I was long gone by then. I was in 5th grade when the school caught fire and was in 6th grade when we returned to Civic Park after going to classes at the Catholic school (St Lukes/St Marys - can't remember the name) until the construction was completed. I remember the Tigers were in the World Series that year and Mrs. Schofield would turn on the radio to listen to the games. '78. Then she headed "up north" to the Midland area. Probably more information than anyone wanted or needed. I'm just surprised to find a blog like this. Very cool. I'll be checking back often. Kathy, I should have spotted Kim Burch, another Civic Parker who ended up at St. Mary's in 7th and 8th grade, I think. Nancy, glad you like the site. The Civic Park fire was a huge event in the neighborhood. I remember seeing the smoke plumes from my front yard and running over to see the fire. 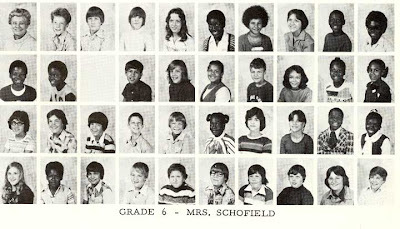 I'll add in: Mrs. Schofield, row 3, photo 2, a young Cathy Wylie? BTW in the worthless trivia section, Civic Park burned on My 5th Birthday, 18 march 1972. I Did kindergarten in the basement of Trinity. 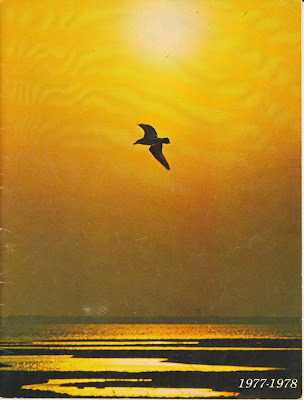 The girl that lived behind the Custacks was Jeanette Petroskey. Her nickname was " Netty" if i recall. I was also in fifth grade when Civic Park burned. I was in Mr. McGuire's class. We had to attend St. Luke's. I thought by virtue of going to school there, it made me Catholic and I gave up red licorice for Lent. The memory of the fire still enters my mind whenever I smell an abundance of smoke. During a parent meeting in my daughter's fifth grade class this year, they asked parents to share a fifth grade memory of our own. The fire was what I shared. I remember a common door between Mr. McGuire and Mrs. Schofield's classes. I guess I was only in the new school for six months if it was rebuilt in January of '73. Does anyone remember the teachers, Mrs. Krill (I don't remember how to spell her name) and Mrs. Allen. They seemed ancient to me at that time. Mrs Allen taught music I believe...and every so often she had children stand and sing a solo as she called our names right down each and every row. And as adults you thought public speaking was scary...think about a public solo! I remember Mrs. Krill.I had her for kindergarten and she was Old then but again I was only 5 but she was a bit scary to me. I had her for second grade in 1957, she was old then. I was scared of her too. I had Mrs. Krill for second grade in 1957-58. She scared me too. And I thought she was old back then. Do you remember how Mrs. Schofield and Mr. McGuire would "flirt" with each other by turning the doorknob between the two rooms? Sorry, I can't contribute anything helpful to the pictures. I was long gone by then. But, I did have Mr. Grindstaff. He was awesome. Also, Mr. Major and Mr. Lefonowitz (sp?) for science. Great times with those fine educators. As for the fire. We lived across the street and saw the first wisp of smoke coming from the roof. My Dad called it in and then grab the camera to take pictures. He had several from when we first saw smoke until after it was over. I was just sharing a few with my son a few nights ago after finding them in a box. It sure was a very sad day. Hi Debbie Albee! It's Sue Edwards. I was just thinking today how I took your summer babysitting job that payed me $15/week. That was a whoppig $.33/hour! I attended Civic Park. Haven't seen this yearbook in years. Wish the rest of it were posted here, I was in either in 1st grade here with Mrs. Hughes or 2nd grade, Mrs. Collard's class. I had Mr. Grindstaff 3-6th. He was great. Remember getting the good grades on tests and sitting in the first row? And his great stories, "Go get the good book that we all love..."
Also had Mr. McGuire and Mrs. Schofield. Mrs. Evans was a great teacher. Mrs. Relyea for music. 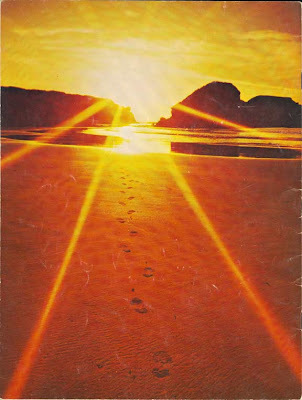 I used to live on Humboldt as well, near Kim Burch and Bill Suttles. Anyway, here's a couple faces I recognize. How about skating a Ballanger Park or on the flooded ball field at Haskell those were the days! Rollerworld was another hot spot for us! I left Civic Park a year or so before the fire, but there are some pics of it on classmates.com. Amazing, I never even went to Civic Park, but most the names are familiar. However I cannot recall if it was because some of the kids transferred to Summerfield after the fire, or from Longfellow. Alas, I was one of those 'problem' students at Longfellow and my memory of those days remains fuzzy even now. I celebrated my 12th birthday and my last night on Lawndale with Kim Burch, Monica Hamper, Becca Banacki, Kelly Conroy, Alicia Morrow (?) and the other Alicia. I would love to know where the class photos come from? I was in Mr. Grindstaff's class, always joked that he was "going on 96" when asked his age. Row 3-Bob Frum, Grant Butterfield, Bill Suttles, Diane Edwards,Jackie Petwosky, Christina?--? Mr. McGuire row three, first picture...Vickie McCartney. I was in first grade...Mrs. Collard so I don't know a lot of the older kids. Vickie lived accross the street from me on Mt. Elliott. I need to dig through my stuff and find my copy of the year book. What a blast from the past! Thanks! I am david mata in mrs schofeilds class. 2nd row down, fourth frame. Andy Weekly is below me. nancy Kopcan is eighth frame on top. Sabrina is two frames to the right of my frame. I used to like the girl to the right of my frame. This is so cool! I remember all this too! Remembering some names. Would've been from '73ish...Ellen Yambrick, Wendy Bucholski, Cheri Shea, Teresa Arnold, Brian Sheska (sp? ),Tina Byrd, Ernie something,Melinda something. maranathateri, Tina Byrd is my sister. In '77-78 I would have been in Mrs. Hughes 1st grade class. 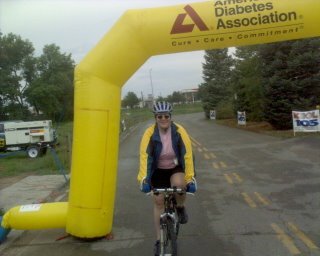 Hey all, stumbled on this blog today. 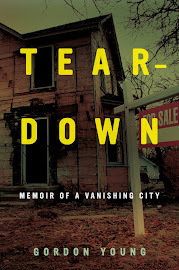 My sisters and I lived on Humboldt (Cathy, Amy, Besty, Margaret McClure), I was 6 when the school burned, we then went to school at Trinity church. The girl in Mr. McGuire's class to his immediate right is Lynette Tigges, I know as they lived right next door to us. Beth Tigges passed away not too long ago, and there was Karen and Mark, also. I would have been in middle school in 77-78, was bused to Holmes near Northwestern.